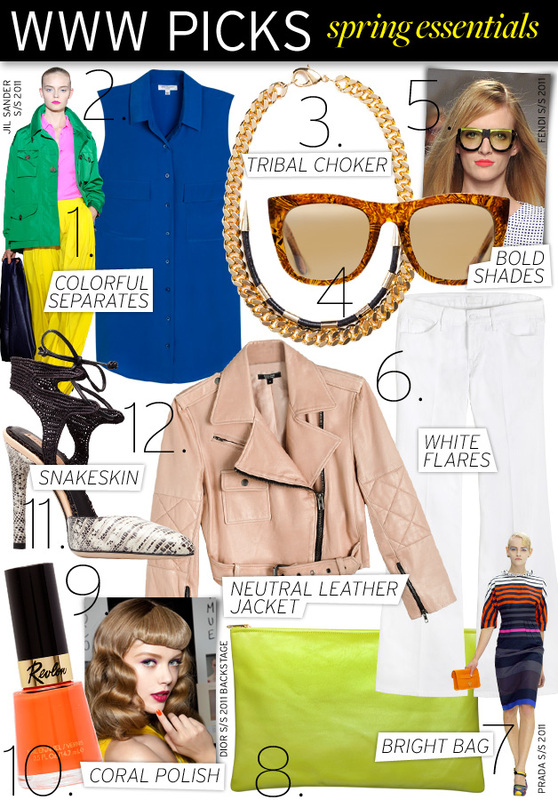 For the most part, I really like WWWD's selections for their spring essentials. 1 & 2. Colorful separates: Yes please (see my outfit post from today)! 3 & 4. Tribal choker: Ehhh. 5. Bold shades: Of course. 6. White flares: I am not totally sold on these for myself, but they probably look excellent on model types. 7 & 8. Bright bag: That's definitely the AA medium carry all, and that color is pretty wild, but I think I could get into it. 9 & 10. Coral Polish: With a tan, yes. 11 & 12. Snakeskin shoe: I don't care for those heels, but my Mee Too flats are my life blood. Darling readers, what are your spring essentials? You can find mine here.